The weather outside may be frightful, but I have found a few products this month that have been making it quite delightful. The cold weather has been messing with my skin making it WAY drier than usual. To combat the intense cold and wind, I have been using First Aid Beauty’s Ultra Repair Cream and it has been amazing. Lightweight, quick to absorb and great at taking care of those itchy, dry spot right under my lips. Another cold weather favorite of mine has been the Formula X System To Go Party Edition. It’s the perfect mini set for an at home manicure. I love that it’s an easily transportable set of everything I need, from nail cleaner to top coat. When it gets cold outside, I’m all about the warm sweaters ad preferably adorable, like this one from J.Crew Factory. It makes me feel like I should be on the slopes or in a cabin with a big mug of hot chocolate. Check out some of the other products I have been loving this month below. What have you been loving this month? Tell me in the comments below! That sweater is completely adorable I'd rock that right now! Ah that sweater! I could do that! Also, I have been dying to try that First Aid Beauty moisturizer. this is lovely. they would make great gifts too! I need to pick up that moisturizer! The winter dry skin is no joke. I love those things too! That sweater is cute, and I did Nature Box for a while-they have some fabulous stuff. Heck yes! Love your picks, especially that highlighter! I have been loving my Birchboxes, sweaters, and moisturizing products! 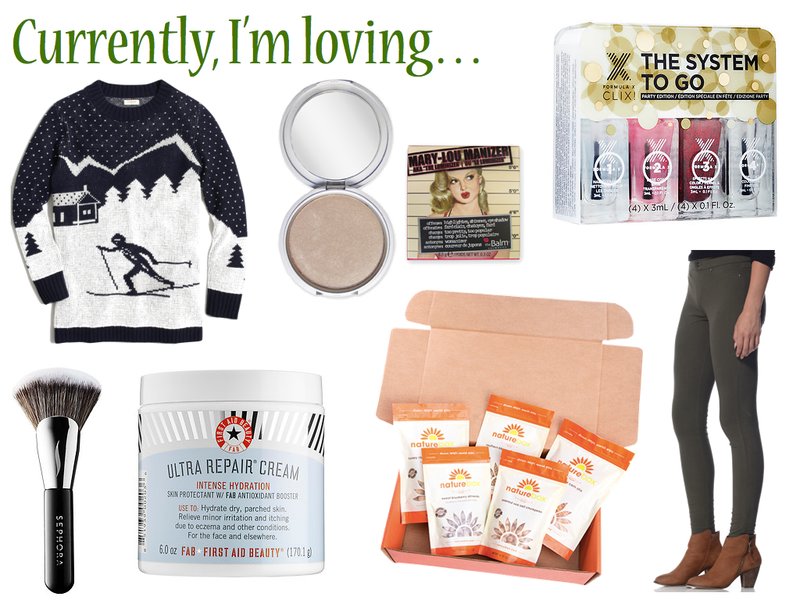 Love the sweater and the moisturizer in your picks!